A 30 yo female with a history of menstrual irregularities with high levels of prolactin. 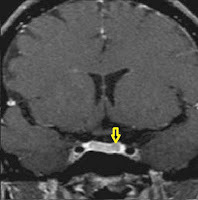 Non contrast coronal T1w image show normal sized pituitary. Coronal T2w image shows an ~ 3mm nodular low signal intensity in left half of pituitary. Dynamic Post contrast study included repeated series of T1w images. The immediate post contrast T1w image show lesion is non enhancing in the background of adjacent normal profusely enhancing pituitary. pituitary stalk has a wide range of normal variation and is difficult to use as a diagnostic sign. Dynamic contrast enhanced images increase the sensitivity of microadenoma detection in immediate post contrast sections seen as non enhancing nodular in the back ground of normal profusely enhancing adjacent pituitary. Delayed post contrast images after ~ 20 minutes may show delayed enhancement of the lesion obscuring it or making it outstaning enhancing lesion where rest of the pituitary is leaves contrast. The most common endocrinologically active pituitary adenomas are prolactinomas. A serum prolactin level above 200 μg/L is very specific for an adenoma. Growth hormone producing adenomas can produce acromegaly in adults and gigantism in children. ACTH producing adenomas cause Cushing disease.